A huge dark rust-scarred ship with 23 crew is edging across the Indian Ocean towards its final destination in Alang in India’s western Gujarat state. The ‘Oriental Nicety’has a dark past however and few will lament the closure of a nasty chapter in human history even though this final voyage is not without its own controversy. The ‘Oriental Nicety’ is none other than the renamed and infamous Exxon Valdes and it is heading for the beach in Alang, the largest ship graveyard on our planet, 23 years after being the protagonist of the most devastating Arctic oil spill. Since the ‘Torrey Canyon’ tanker accident in 1968, the first to be witnessed globally on our TV screens, there has been huge public concern about oil spills. It was media attention in 1968 that made the difference as millions of people saw day to day accounts of some of their favourite beaches in Cornwall covered in black sludge. They also saw the pathetic statements by public officials trying to hide the true magnitude of the disaster and the inadequate response, including bombing the vessel with napalm (which Britain had previously denied possessing) and pumping huge amounts of toxic detergents, a practice now prohibited. Though a teenager at the time, the vivid black and white TV images and sense of hopelessness and disempowerment still haunt me today. The Exxon Valdes grounded on a reef in Prince William Sound, Alaska on March 24, 1989 as a result of a serious error in navigation and spilled between a quarter and half million barrels of oil (over 42,000 m3) into the sound; the largest spill in the US until Deepwater Horizon two years ago. The damage, along 1,300 miles of remote Arcticcoastline, was appalling, affecting rocky shores and entire populations of seabirds, otters and seals. Controversial toxic dispersants were deployed again and some 11,000 workers struggled to clean up the mess. Some of the damage remains today. With a strong media presence sending images across the world, there was no place to hide for those responsible and the further extraction of oil from the sensitive Alaskan Arctic was severely constrained. The role of the media in these incidents was crucial. Three years after the Exxon Valdes spill, between January and November 1991, fires ignited by Saddam Hussein’s troops raged in 600 Kuwaiti oil rigs and the massive oil storage depots on the coast were breached causing one of the largest oil spills in the last century. The UN was convened in a special session in Geneva to discuss the likely environmental consequences and I had to act as a spokesperson for UNEP and face a challenging Q and A session with UN Permanent Representatives from all over the world in plenary. A difficult career moment and we described the potential worst case scenario of catastrophic pollution, wrote press releases and dealt with the media. Desperate for footage, some channels showed compelling images of hapless oil-covered sea birds,‘borrowed’ from the Valdes incident. Public expectation of images was high but nobody in their right mind would be filming seabirds in a war zone. The 1991 Gulf war resulted in some 500,000 m3 of oil spilled into the virtually enclosed Gulf, over ten times the volume afflicting Prince William Sound. 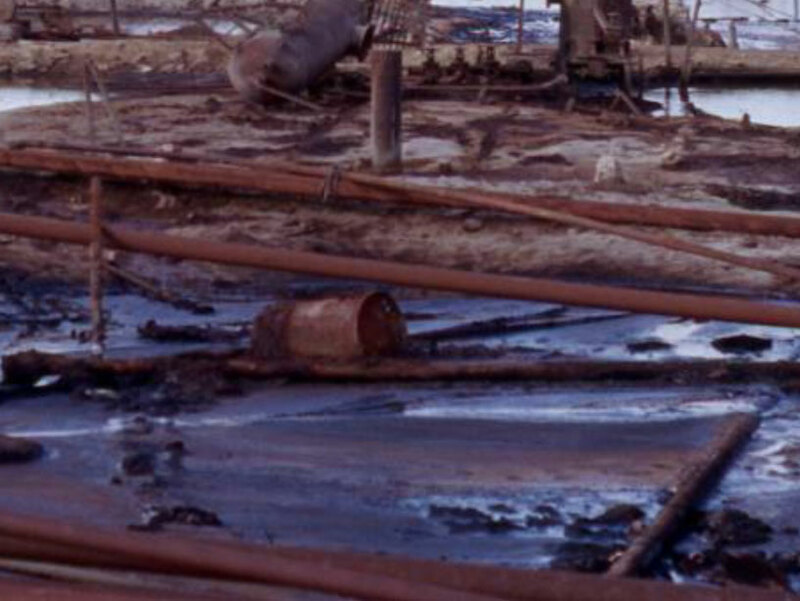 We assessed the early impact and published our results in Nature; half the oil had evaporated in the intense desert heat and much of the remainder had sunk or been recovered; pollution levels and geographical spread were lower than expected. Despite this, there is still evidence of long-term damage to coastal wetland areas. It was clear though, that the system had been saved from the level of destruction seen in Alaska thanks to the extreme heat that promoted evaporation and bacterial growth. ‘Worst’ is not ‘biggest’ with oil spills and Arctic systems are the most fragile and vulnerable. That’s why we are worried about Arctic oil production. So back to the Exxon Valdes. At the time when media attention was focussed on environmental impacts, the vessel was refloated and towed to San Diego for inspection and repairs. The ship was subsequently sold several times, had six name changes and suffered another serious accident through a collision off China in 2010. ‘Oriental Nicety’ was an ironic final name for this hard-worked vessel. But my story doesn’t end there. The ship breakers along the beaches in Alang - pristine until the early 1980s - are the graveyard for over half the world’s vessels. Dismantling and salvaging old vessels is a dirty business as they harbour toxic waste including asbestos. The yards were notorious for poor health and safety standards and pollution (see the recent Indian documentary Into the Graveyard. But they employ tens of thousands of workers and recycle thousands of tons of steel and components every year. Thanks to some shocking documentaries including the feted 2004 Canadian film Shipbreakers, public attention was drawn to this darker side of shipping. Indian NGOs have been active in demanding higher standards and some ship owners have been exposed. Standards are improving and Japan and the Gujarat Government have signed a MOU to assist in upgrading operations to international standards set by bodies such as the International Maritime Organisation. And the former Exxon Valdes has sailed into yet another controversy. As it headed towards Alang under its charming sixth guise in April, it was reported and subjected to a court order by India’s Supreme Court. Now it has been allowed to continue its journey but the Court ruled that future vessels will have to demonstrate compliance with the UN’s Basel Convention governing the international movement of hazardous waste. This victory for India’s environmentalists leaves the ship in its final act as an agent of the dirtier side of globalisation. Thanks to the media, it had no place to hide. Here in SAMS, we are actively engaged in work to understand and mitigate potential consequences of Arctic oil spills. Our autonomous underwater vehicle is working under the sea ice cover and improving our knowledge of dispersion processes. We are concerned that precaution should be exercised in the development of oil exploration and transportation in Arctic waters until there is clear scientific evidence showing acceptable levels of risk. Professor Laurence Mee is the director of SAMS, leading a team of ca 150 staff and 120 students passionate about marine science. All entries reflect the personal opinion of the author and are not statements of policy of SAMS Council or Membership.